mintster.in is India's popular website which helps its users invest smartly. It offers free financial planning calculators, online investment platform & informative articles to self-help investors. The document provides a very detailed comparison of top 5 health insurance plans in India with respect to all the features. It will be of lot of help to individuals with very little knowledge of basic health insurance and also to experts. This report provides a snapshot of Indian economy, performance of Equity Markets, Debt Markets and 15 year performance of Mutual Funds as on August 2014. Just follow these 5 mantras to investing. You will be able to not only maximize your returns but also minimize your risks. Life Insurance policy is a contract between an individual and insurance company where in the insurance company agrees to pay to the policy holder a decided amount in case of unfortunate death of the policy holder. In return, the policy holder agrees to pay an annual payment called premium to the insurance company. Our health depends on a number of internal & external factors. An unexpected disease or medical emergency can cost an individual lakhs. Health Insurance policy is a contract between a policy holder & insurance company wherein the insurance company agrees to remunerate the policy holder all the expenses incurred by policy holder for hospitalization and treatment of specified diseases. Sampoorna Suraksha - Why you need Insurance? Investing in financial products helps one to have financial growth. But financial planning is not only about financial growth but also about protecting oneself from financial risks. There are many disadvantages of investing money directly without considering one’s goals, liquidity requirements & financial profile. Where Should I Invest my Idle Cash? Instead of returns of 4-6% which you get in a savings account, you can easily get returns of more than 9% with as much safety, liquidity and stability by investing in this very popular product. 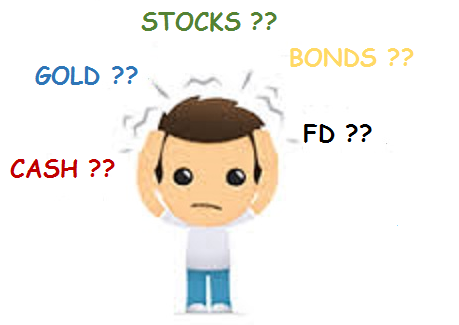 Why do people invest a lot into Debt Mutual Funds? WHy don't they just put their money in Fixed Deposits in banks? Because Debt Mutual Funds offer many advantages as compared to Fixed Deposits. The government of India allows various expenses & investments to be deducted from the taxable income of the assesse. This helps the assesse to bring down the taxable income & helps him/her to increase take home salary by paying lesser taxes. People normally make a mess of heir lives out of investing in Share markets. There is a very simple and very efficient way of investing in share markets to get higher returns. How to invest, How much to invest & Where to invest? These are some of the basic questions which come to the mind of any fresher joining the workforce. The answers to these questions elude most of the professionals with experience as well. Why & how you should start investing in Equity markets now!